Chris McGrath/Getty ImagesPeople protesting the disappearance of the journalist Jamal Khashoggi. But sceptics say the device’s cellular connection would not be available in Turkey, that its Bluetooth connection would have been lost, and that the Apple Watch does not support the fingerprint-unlock feature. Some have speculated that the Apple Watch angle is a cover story meant to mask the Turkish government’s true means of obtaining information about Khashoggi. Technology and security experts are disputing reports from the Turkish press, apparently seeded by Turkish officials, that a missing journalist’s Apple Watch captured audio of him being tortured and killed inside the Saudi Consulate in Istanbul. 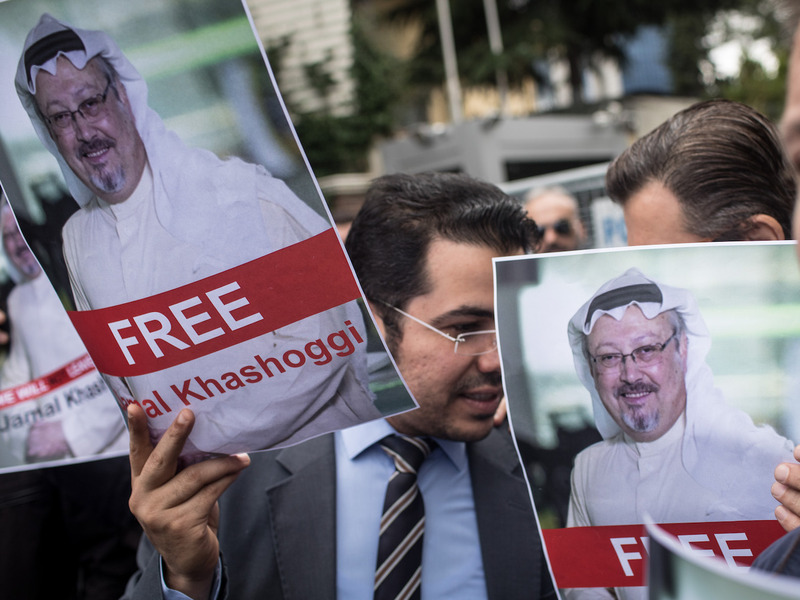 Jamal Khashoggi, a Saudi journalist critical of Saudi Arabia’s government, disappeared after entering the consulate on October 2. His fate remains unclear. Turkish officials have been quoted as saying they believe Khashoggi was murdered inside the consulate, an allegation rejected by Saudi Arabia. According to Reuters, the Turkish newspaper Sabah reported on Saturday that Khashoggi started recording audio on his Apple Watch when he entered the consulate and that those recordings were beamed to his iPhone, which was being held by his fiancée outside the consulate. It said that the iCloud and his phone received audio recordings of his torture and killing and that his assailants subsequently noticed and unlocked the watch with Khashoggi’s fingerprint and proceeded to delete some files. Surprised by how many serious observers are running with the Khashoggi-used-his-Apple-Watch-story. As long as there is no good evidence, the more plausible scenario is a shrewd cover story to protect Turkish sources & methods—a cover story that would predictably go viral. First, some pointed out that the watch would not have had access to cellular data because Turkey does not support LTE. Therefore, the watch would not have been able to connect to the internet unless paired with a nearby iPhone or logged on to the consulate’s Wi-Fi. If Khashoggi’s iPhone was with his fiancée outside the consulate, the Watch would most likely have been out of range. The end of the report perhaps poses the biggest problem, because the Apple Watch does not support a Touch ID system, which recognises fingerprints. Some also pointed to the fact that the Apple Watch does not have a native audio-recording app – though it is possible to download one from third-party app makers. The National correspondent Joyce Karam also said that when she attended an event at the same consulate, she’d been obliged to remove her Fitbit fitness band, making her sceptical that Khashoggi would have been able to retain his Apple Watch. 4-For a press event last year at #Saudi embassy, I was asked to take off my Fitbit at door. Others their Apple Watch. 5-More likely theory is that Turkey bugged the Saudi consulate. There is some speculation that the Apple Watch report is a cover story meant to mask the Turkish government’s actual means of obtaining information about Khashoggi’s disappearance. “I think what’s happened, clearly, is the Turks have the Saudi Consulate wired, they have transmitters,” a former CIA officer named Robert Baer told CNN. “It seems far more likely that they have other means of detecting what foreign diplomats are up to and the Apple Watch story is just useful cover,” the BBC’s technology correspondent Rory Cellan-Jones said.